Here we have covered everything you need to know about BHIM; the UPI enabled app from NPCI launched by Prime Minister Narendra Modi at the Digi Dhan Mela event in New Delhi. BHIM App is a proposition by Government of India to ease the process of digital payment and increase the cashless society. BHIM is formed by the National Payment Corporation of India (NPCI). BHIM is made in India & dedicated to the service of the nation. 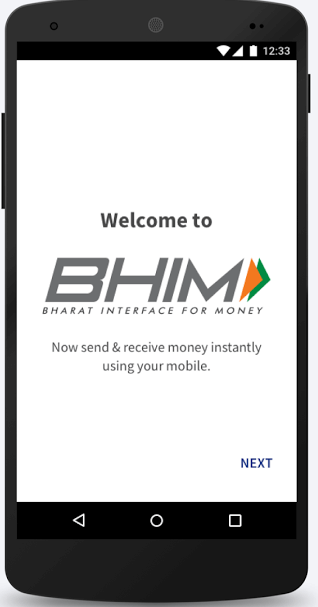 BHIM stands for Bharat Interface for Money, an Android app which is bound with UPI & USSD based payment facility at one spot. The app has some amazing features like fingerprint authentication. So check out below to know what is BHIM app and how to use it for payment. 2) Open the BHIM App. 3) Then Give some permission & Send a message from your registered mobile number. (It is automatically done by giving permission to send message). 4) Then set a UPI PIN for the bank account. 5) Register your bank account by choosing your bank name with BHIM App. 6) Your mobile number is your payment address (PA), Example- 9760xxxxxx@upi or You can create a New one. 7) You can easily start transacting with each other. 2) Also QR Code Method: You can scan a QR code for quicker entry of payment addresses. Merchants can efficiently print their QR Code for display. 3) Money can also be sent to non-UPI supported banks using IFSC and MMID. 4) Enter your amount which you want to send to another person. 5) Click on the yes button. Your fund will be transferred successfully. NOTE: Transaction Limits: Maximum of Rs. 10,000 per transaction and Rs. 20,000 within 24 hours. Send / Receive Money: Send money to or receive money from family, friends, and customers through a mobile number or payment address. Money can also be sent to non-UPI helped banks using IFSC & MMID. You can also get money by sending a request & reverse payments if needed. Check Balance: You can check your bank balance & all transactions details. Custom Payment Address: You can build a custom payment address in extension to your phone number. You can build a custom payment address in extension to your phone number. QR Code: You can scan a QR code for quicker entry of payment addresses. Merchants can efficiently print their QR Code for the show. Transaction Limits: Maximum of Rs 10000 per transaction and Rs 20000 within 24 hours. Language raised: Hindi and English. More languages are coming soon! Allahabad Bank, Axis Bank, Andhra Bank, Bank of Baroda, Bank of India, Bank of Maharashtra, Central Bank of India, Federal Bank, Dena Bank, HDFC Bank, ICICI Bank, IDFC Bank, IDBI Bank, Indian Bank, Indian Overseas Bank, IndusInd Bank, Karnataka Bank, Kotak Mahindra Bank, Oriental Bank of Commerce, RBL Bank, South Indian Bank, Punjab National Bank, State Bank of India, Syndicate Bank, Union Bank of India, United Bank of India, Vijaya Bank. With BHIM App, your mobile number will be your primary identifier. The app has specialties like account balance check. Scan QR Code to send or receive payment if you do not want to share mobile number. Under profile section, you can create custom payment address. USSD feature can be used by dialing *99# on any phone to reach your Bank details more securely. Sir, kindly intimate how the transaction made by mistake through Bhim be reversed ?